May: The Force. An Incredible 6D Clerkenwell ARTSlab. Is this our most lavish line-up yet? 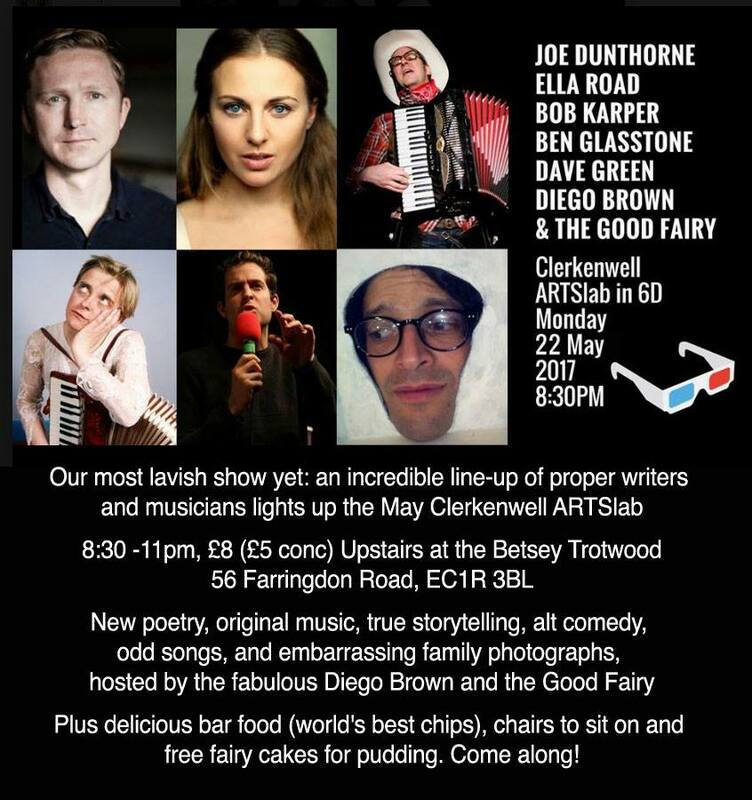 Upstairs at the Betsey Trotwood has never felt more like Oscar night – as an incredible line-up of proper writers and musicians lights up the May Clerkenwell ARTSlab in gloriously unlikely 6D. Novelist JOE DUNTHORNE (Submarine, Wild Abandon) does poetry. Musical storyteller BOB KARPER does the dark side. Comedian DAVE GREEN does surreal deadpan. Polymath BEN GLASSTONE does songs in the key of smile. Actor-poet ELLA ROAD does SLAB for the first time. Hosteuses DIEGO BROWN AND THE GOOD FAIRY does yer head in. Plus delicious bar food (often the world’s best chips), chairs to sit on and free fairy cakes for pudding. Bring £8 to get in or £5 concesssions. JOE DUNTHORNE was born and brought up in Swansea, South Wales. His first novel, Submarine, was translated into sixteen languages and adapted for film by Richard Ayoade. His second, Wild Abandon, won the 2012 Encore Award. His debut poetry pamphlet was published by Faber and Faber. His third novel, The Adulterants, will be published in February 2018. BOB KARPER says normal can be extraordinary: if you look in detail at an everyday life there is art. You can find beauty & inspiration right underneath the couch. Bob is a performance artist, theatre maker, musician and filmmaker. He was raised in a suburb of Chicago, has lived in Japan and San Francisco, and is now settled in East London. He likes having a plan. He is allergic to cats. And he makes solo shows based on events in the lives of ordinary people – family, friends & acquaintances – using slides, film, puppets and live original music. DAVE GREEN’s surreal one-liners and deadpan delivery have seen him win the wild card vote in the BBC New Comedy Award 2013. In 2014 he was nominated by a panel of industry professionals to take part in the Leicester Mercury Comedian of the Year. He was a finalist in the Leicester Square New Comedian 2012 and is the winner of the Comedy Knights Fresh Comedian 2014. “Could be a contender to follow in the footsteps of Milton Jones”. Ella Road is an actor, writer and poet from Norf Landaaan. She writes about all kinds of stuff. She tends to find the funny bits in the serious, and the serious bits in the funny (and sometimes even manages to make it rhyme). She works across stage, screen and radio as both writer and actor, and is co-founder of Flux Theatre. This entry was posted in Live, News and tagged ARTSlab, betsey, comedy, gig, live, poetry. Bookmark the permalink.